A facelift (rhytidectomy) is a surgical procedure to tighten underlying facial muscles and re-drape the skin of your face and neck to provide a more youthful appearance. A facelift can be done alone or in conjunction with other procedures such as a forehead lift, eyelid surgery or nasal surgery. The average cost of this procedure in the UK is between £3,500 and £ 8,500. The best candidate for a facelift is someone whose face and neck have begun to sag, but whose skin still has some elasticity and whose bone structure is strong and well-defined. Most patients are in their forties to sixties, but facelifts can be done successfully on older and sometimes younger people. A facelift can make you look younger and fresher, and it may enhance your self-confidence in the process. But it can not give you a totally different look, nor can it restore the health and vitality of your youth. There are many things you can do to have your body in optimum condition before your surgery. Read our Health Booster page to find out. Most facelifts are performed under local anaesthesia, combined with a sedative to make you drowsy. You’ll be awake but relaxed, and your face will be insensitive to pain. (However, you may feel some tugging or occasional discomfort.) Some surgeons prefer a general anaesthesia. In that case, you’ll sleep through the operation. A facelift usually takes several hours. For extensive procedures, some surgeons may schedule two separate sessions. Every surgeon approaches the procedure in his or her own way. Some complete one side of the face at a time, and others move back and forth between the sides. 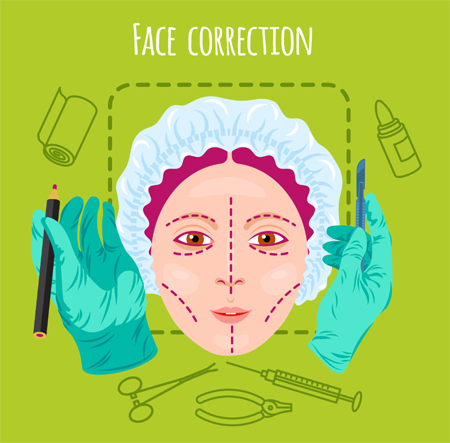 The exact placement of incisions and the sequence of events depends on your facial structure and your surgeon’s technique. Facial, neck tissue and muscle may be separated; fat may be rimmed or suctioned and underlying muscle may be tightened. In general, the surgeon separates the skin from the fat and muscle below. Fat may be trimmed or suctioned from around the neck and chin to improve the contour. The surgeon then tightens the underlying muscle and membrane, pulls the skin back, and removes the excess. Stitches secure the layers of tissue and close the incisions; metal clips may be used on the scalp. After deep tissues are tightened, the excess skin is pulled up and back, trimmed and sutured into place. Following surgery, a small, thin tube may be temporarily placed under the skin behind your ear to drain any blood that might collect there. The surgeon may also wrap your head loosely in bandages to minimize bruising and swelling. There isn’t usually significant discomfort after surgery; if there is, it can be lessened with the pain medication prescribed by your surgeon. (Severe or persistent pain or a sudden swelling of your face should be reported to your surgeon immediately.) Some numbness of the skin is quite normal; it will disappear in a few weeks or months. Your doctor may tell you to keep your head elevated and as still as possible for a couple of days after surgery, to keep the swelling down. If you’ve had a drainage tube inserted, it will be removed one or two days after surgery. Bandages, when used, are usually removed after one to five days. Don’t be surprised at the pale, bruised, and puffy face you see. Just keep in mind that in a few weeks you’ll be looking normal. At the beginning, your face may look and feel rather strange. Your features may be distorted from the swelling, your facial movements may be slightly stiff and you’ll probably be self-conscious about your scars. Some bruising may persist for two or three weeks, and you may tire easily. It’s not surprising that some patients are disappointed and depressed at first. By the third week, you’ll look and feel much better. Most patients are back at work about ten days to two weeks after surgery. If you need it, special camouflage makeup can mask most bruising that remains. Men may find they have to shave in new places; behind the neck and ears where areas of beard growing skin have been re positioned. You’ll have some scars from your facelift, but they’re usually hidden by your hair or in the natural creases of your face and ears. In any case, they’ll fade within time and should be scarcely visible. Please note that this information is offered freely to individuals considering cosmetic surgery. No rights are granted and it is not to be reprinted or copied without the prior written consent of Cosmetic Surgery Net – UK . Beware that although efforts have been made to assure accuracy, many of the issues discussed here are a matter of professional opinion. Consultation with a Qualified Plastic Surgeon should be obtained to answer more detailed questions and advise you based on your personal circumstances.